Vassar College has the technology that will allow instructors to stream videos for their students’ viewing. But instructors must first determine that doing so does not violate copyright law. Most film and audio recordings are protected by copyright law, meaning that you can’t make copies and/or distribute copies unless certain exemptions exist. It is incumbent upon you, the instructor, to determine if any particular material can be copied and shared in any particular situation. If the work is in the public domain, due to its age or because it was produced with federal funding, or simply because the creator waived copyright, you’re free to copy it. If you’ve gotten explicit permission from the copyright holder or acquired a license to that effect, you’re free to copy it. If, after a reasonable and earnest effort, you’ve been unable to contact the copyright holder to request permission, you may copy it. Under the TEACH act, you’re allowed to copy a non-dramatic work (i.e. a documentary) and post it online for members of your class, as long as it is required for the class, and as long as it is directly related to issues that the class will be discussing during class meetings. The copying and posting should be done yourself, not by an institutional unit. For dramatic works, the TEACH Act only supports posting small portions of the work. 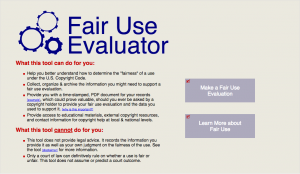 If you’ve determined that your intended use cannot be strongly defended by the fair use guidelines, or any of the other exemptions, then you should consider other ways of providing your students with access to the work, such as scheduling a screening or leaving a copy of the material on reserve. Many films are also now available inexpensively, for online rental to individuals; Google the film title and the results may show that Amazon Video, YouTube, or iTunes may stream the video to individuals for $2.99 each.